Through various teaching methods we are able to instill safe practices among your employees for their day to day activities on the job. Realizing the importance of these practices is the first step in creating a safe and productive work environment. Each class is highly individual and based around participation and the needs of each person in the class, as well as the company's needs. 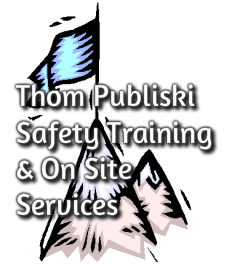 We are here to teach your employees that safe behavior is in their own best interests. It is the voluntary safe behavior of these employees that reduces workplace injury and illness, and creates a more profitable business!